D. B. Cooper is a media epithet popularly used to refer to an unidentified man who hijacked a Boeing 727 aircraft in the northwest United States, in the airspace between Portland, Oregon, and Seattle, Washington, on the afternoon of Wednesday, November 24, 1971. He extorted $200,000 in ransom (equivalent to $1,240,000 in 2018) and parachuted to an uncertain fate. Despite an extensive manhunt and protracted FBI investigation, the perpetrator has never been located or identified. It remains the only unsolved case of air piracy in commercial aviation history. Hijacking a Boeing 727 on November 24, 1971, and parachuting from the plane mid-flight; has never been identified or captured. A Northwest Orient Boeing 727-100, one similar to the one involved in the hijacking. Available evidence and a preponderance of expert opinion suggested from the beginning that Cooper probably did not survive his high-risk jump, but his remains were never recovered. The FBI nevertheless maintained an active investigation for 45 years after the hijacking. Despite a case file that grew to over 60 volumes over that period, no definitive conclusions have been reached regarding Cooper's true identity or whereabouts if he survived the jump. The suspect purchased his airline ticket using the alias Dan Cooper, but because of a news media miscommunication he became known in popular lore as "D. B. Cooper". Numerous theories of widely varying plausibility have been proposed over the years by investigators, reporters, and amateur enthusiasts. A young boy discovered a small cache of ransom bills along the banks of the Columbia River in February 1980. The find triggered renewed interest but ultimately only deepened the mystery, and the great majority of the ransom remains unrecovered. The FBI officially suspended active investigation of the case in July 2016, but the agency continues to request that any physical evidence that might emerge related to the parachutes or the ransom money be submitted for analysis. On Thanksgiving eve, November 24, 1971, a middle-aged man carrying a black attaché case approached the flight counter of Northwest Orient Airlines at Portland International Airport. He identified himself as "Dan Cooper" and used cash to purchase a one-way ticket on Flight 305, a 30-minute trip north to Seattle. Cooper boarded the aircraft, a Boeing 727-100 (FAA registration N467US), and took seat 18C (18E by one account, 15D by another) in the rear of the passenger cabin. He lit a cigarette and ordered a bourbon and soda. Fellow passengers described him as a man in his mid-forties, between 5 ft 10 in (1.78 m) and 6 ft 0 in (1.83 m) tall. He wore a black lightweight raincoat, loafers, a dark suit, a neatly pressed white collared shirt, a black clip-on tie, and a mother of pearl tie pin. Flight 305 was from Washington D.C. to Seattle, with stops in Minneapolis, Great Falls, Missoula, Spokane, and Portland. It was approximately one-third full when it left Portland on schedule at 2:50 p.m. PST. Shortly after takeoff, Cooper handed a note to Florence Schaffner, the flight attendant situated nearest to him in a jump seat attached to the aft stair door. Schaffner assumed that the note contained a lonely businessman's phone number and dropped it unopened into her purse. Cooper leaned toward her and whispered, "Miss, you'd better look at that note. I have a bomb." The note was printed in neat, all-capital letters with a felt-tip pen. Its exact wording is unknown, because Cooper later reclaimed it, but Schaffner recalled that the note said that Cooper had a bomb in his briefcase. After Schaffner read the note, Cooper told her to sit beside him. Schaffner did as requested, then quietly asked to see the bomb. Cooper opened his briefcase long enough for her to glimpse eight red cylinders ("four on top of four") attached to wires coated with red insulation, and a large cylindrical battery. After closing the briefcase, he stated his demands: $200,000 in "negotiable American currency"; four parachutes (two primary and two reserve); and a fuel truck standing by in Seattle to refuel the aircraft upon arrival. Schaffner conveyed Cooper's instructions to the pilots in the cockpit; when she returned, Cooper was wearing dark sunglasses. The pilot, William Scott, contacted Seattle–Tacoma Airport air traffic control, which in turn informed local and federal authorities. The 36 other passengers were given false information that their arrival in Seattle would be delayed because of a "minor mechanical difficulty". Northwest Orient's president, Donald Nyrop, authorized payment of the ransom and ordered all employees to cooperate fully with the hijacker's demands. The aircraft circled Puget Sound for approximately two hours to allow Seattle police and the FBI sufficient time to assemble Cooper's parachutes and ransom money, and to mobilize emergency personnel. Schaffner recalled that Cooper appeared familiar with the local terrain; at one point he remarked, "Looks like Tacoma down there," as the aircraft flew above it. He also correctly mentioned that McChord Air Force Base was only a 20-minute drive (at that time) from Seattle-Tacoma Airport. Schaffner described him as calm, polite, and well-spoken, not at all consistent with the stereotypes (enraged, hardened criminals or "take-me-to-America" political dissidents) popularly associated with air piracy at the time. Tina Mucklow, another flight attendant, agreed. "He wasn't nervous," she told investigators. "He seemed rather nice. He was never cruel or nasty. He was thoughtful and calm all the time." He ordered a second bourbon and water, paid his drink tab (and attempted to give Schaffner the change), and offered to request meals for the flight crew during the stop in Seattle. FBI agents assembled the ransom money from several Seattle-area banks – 10,000 unmarked 20-dollar bills, most with serial numbers beginning with the letter "L" indicating issuance by the Federal Reserve Bank of San Francisco, and most from the 1963A or 1969 series – and made a microfilm photograph of each of them. Cooper rejected the military-issue parachutes offered by McChord AFB personnel, instead demanding civilian parachutes with manually operated ripcords. Seattle police obtained them from a local skydiving school. At 5:24 p.m. PST, Cooper was informed that his demands had been met, and at 5:39 p.m. the aircraft landed at Seattle-Tacoma Airport. It was more than an hour after sunset and Cooper instructed Scott to taxi the jet to an isolated, brightly lit section of the apron and close each window shade in the cabin to deter police snipers. Northwest Orient's Seattle operations manager, Al Lee, approached the aircraft in street clothes to avoid the possibility that Cooper might mistake his airline uniform for that of a police officer. He delivered the cash-filled knapsack and parachutes to Mucklow via the aft stairs. Once the delivery was completed, Cooper ordered all passengers, Schaffner, and senior flight attendant Alice Hancock to leave the plane. During refueling, Cooper outlined his flight plan to the cockpit crew: a southeast course toward Mexico City at the minimum airspeed possible without stalling the aircraft – approximately 100 knots (185 km/h; 115 mph) – at a maximum 10,000-foot (3,000 m) altitude. He further specified that the landing gear remain deployed in the takeoff/landing position, the wing flaps be lowered 15 degrees, and the cabin remain unpressurized. Copilot William Rataczak informed Cooper that the aircraft's range was limited to approximately 1,000 miles (1,600 km) under the specified flight configuration, which meant that a second refueling would be necessary before entering Mexico. Cooper and the crew discussed options and agreed on Reno, Nevada, as the refueling stop. With the plane's rear exit door open and its staircase extended, Cooper directed the pilot to take off. Northwest's home office objected, on grounds that it was unsafe to take off with the aft staircase deployed. Cooper countered that it was indeed safe, but he would not argue the point; he would lower it once they were airborne. An FAA official requested a face-to-face meeting with Cooper aboard the aircraft, which was denied. The refueling process was delayed because of a vapor lock in the fuel tanker truck's pumping mechanism, and Cooper became suspicious; but he allowed a replacement tanker truck to continue the refueling—and a third after the second ran dry. At approximately 7:40 p.m., the Boeing 727 took off with only five people onboard: Cooper, pilot Scott, flight attendant Mucklow, copilot Rataczak, and flight engineer H. E. Anderson. Two F-106 fighter aircraft were scrambled from McChord Air Force Base and followed behind the airliner, one above it and one below, out of Cooper's view. A Lockheed T-33 trainer, diverted from an unrelated Air National Guard mission, also shadowed the 727 before running low on fuel and turning back near the Oregon–California state line. Overall there were five planes in total trailing the hijacked plane. Not a single one of them reportedly saw him jump and none of them could pinpoint a location where he could have landed. After takeoff, Cooper told Mucklow to join the rest of the crew in the cockpit and remain there with the door closed. As she complied, Mucklow observed Cooper tying something around his waist. At approximately 8:00 p.m., a warning light flashed in the cockpit, indicating that the aft airstair apparatus had been activated. The crew's offer of assistance via the aircraft's intercom system was curtly refused. The crew soon noticed a subjective change of air pressure, indicating that the aft door was open. At approximately 8:13 p.m., the aircraft's tail section sustained a sudden upward movement, significant enough to require trimming to bring the plane back to level flight. At approximately 10:15 p.m., the aircraft's aft airstair was still deployed when Scott and Rataczak landed the 727 at Reno Airport. FBI agents, state troopers, sheriff's deputies, and Reno police surrounded the jet, as it had not yet been determined with certainty that Cooper was no longer aboard, but an armed search quickly confirmed his absence. FBI agents recovered 66 unidentified latent fingerprints aboard the airliner. The agents also found Cooper's black clip-on tie, his tie clip and two of the four parachutes, one of which had been opened and two shroud (suspension) lines cut from its canopy. Authorities interviewed eyewitnesses in Portland, Seattle, and Reno, and all those who personally interacted with Cooper. A series of composite sketches were developed. Local police and FBI agents immediately began questioning possible suspects and among them considered more than 800; of these, all but two dozen were eliminated from the investigation. An Oregon man named D. B. Cooper who had a minor police record was one of the first persons of interest in the case. He was contacted by Portland police on the off-chance that the hijacker had used his real name or the same alias in a previous crime. He was quickly ruled out as a suspect, but a local reporter named James Long, rushing to meet an imminent deadline, confused the eliminated suspect's name with the pseudonym used by the hijacker. A wire service reporter (Clyde Jabin of UPI by most accounts, Joe Frazier of the AP by others) republished the error, followed by numerous other media sources; the moniker "D. B. Cooper" became lodged in the public's collective memory. An animation of the 727's rear airstair, deploying in flight. The animation also shows Cooper jumping off the airstair. The gravity-operated apparatus remained open until the aircraft landed. A precise search area was difficult to define, as even small differences in estimates of the aircraft's speed, or the environmental conditions along the flight path (which varied significantly by location and altitude), changed Cooper's projected landing point considerably. An important variable was the length of time he remained in free fall before pulling his ripcord—if indeed he succeeded in opening a parachute at all. Neither of the Air Force fighter pilots saw anything exit the airliner, either visually or on radar, nor did they see a parachute open; but at night, with extremely limited visibility and cloud cover obscuring any ground lighting below, an airborne human figure clad entirely in black clothing could easily have gone undetected. The T-33 pilots never made visual contact with the 727 at all. In an experimental re-creation, Scott piloted the aircraft used in the hijacking in the same flight configuration. FBI agents, pushing a 200-pound (91 kg) sled out of the open airstair, were able to reproduce the upward motion of the tail section described by the flight crew at 8:13 p.m. Based on this experiment, it was concluded that 8:13 p.m. was the most likely jump time. At that moment the aircraft was flying through a heavy rainstorm over the Lewis River in southwestern Washington. Initial extrapolations placed Cooper's landing zone within an area on the southernmost outreach of Mount St. Helens, a few miles southeast of Ariel, Washington, near Lake Merwin, an artificial lake formed by a dam on the Lewis River. Search efforts focused on Clark and Cowlitz counties, encompassing the terrain immediately south and north, respectively, of the Lewis River in southwest Washington. FBI agents and sheriff's deputies from those counties searched large areas of the mountainous wilderness on foot and by helicopter. Door-to-door searches of local farmhouses were also carried out. Other search parties ran patrol boats along Lake Merwin and Yale Lake, the reservoir immediately to its east. No trace of Cooper, nor any of the equipment presumed to have left the aircraft with him, was found. The FBI also coordinated an aerial search, using fixed-wing aircraft and helicopters from the Oregon Army National Guard, along the entire flight path (known as Victor 23 in standard aviation terminology but "Vector 23" in most Cooper literature) from Seattle to Reno. Although numerous broken treetops and several pieces of plastic and other objects resembling parachute canopies were sighted and investigated, nothing relevant to the hijacking was found. Shortly after the spring thaw in early 1972, teams of FBI agents aided by some 200 Army soldiers from Fort Lewis, along with Air Force personnel, National Guardsmen, and civilian volunteers, conducted another thorough ground search of Clark and Cowlitz counties for eighteen days in March, and then an additional eighteen days in April. Electronic Explorations Company, a marine salvage firm, used a submarine to search the 200-foot (61 m) depths of Lake Merwin. Two local women stumbled upon a skeleton in an abandoned structure in Clark County; it was later identified as the remains of a female teenager who had been abducted and murdered several weeks before. Ultimately, the search operation—arguably the most extensive, and intensive, in U.S. history—uncovered no significant material evidence related to the hijacking. In early 1973, with the ransom money still missing, The Oregon Journal republished the serial numbers and offered $1,000 to the first person to turn in a ransom bill to the newspaper or any FBI field office. In Seattle, the Post-Intelligencer made a similar offer with a $5,000 reward. The offers remained in effect until Thanksgiving 1974, and though there were several near-matches, no genuine bills were found. In 1975 Northwest Orient's insurer, Global Indemnity Co., complied with an order from the Minnesota Supreme Court and paid the airline's $180,000 claim on the ransom money. Subsequent analyses indicated that the original landing zone estimate was inaccurate: Scott, who was flying the aircraft manually because of Cooper's speed and altitude demands, later determined that his flight path was significantly farther east than initially assumed. Additional data from a variety of sources—in particular Continental Airlines pilot Tom Bohan, who was flying four minutes behind Flight 305—indicated that the wind direction factored into drop zone calculations had been wrong, possibly by as much as 80 degrees. This and other supplemental data suggested that the actual drop zone was probably south-southeast of the original estimate, in the drainage area of the Washougal River. On July 8, 2016, the FBI announced that it was suspending active investigation of the Cooper case, citing a need to focus its investigative resources and manpower on issues of higher and more urgent priority. Local field offices will continue to accept any legitimate physical evidence—related specifically to the parachutes or the ransom money—that may emerge in the future. The 60-volume case file compiled over the 45-year course of the investigation will be preserved for historical purposes at FBI headquarters in Washington, D.C. On the FBI website, there is currently a 28-part packet full of evidence gathered over the years. All the evidence is open to the public to read. The official physical description of Cooper has remained unchanged and is considered reliable. Flight attendants Schaffner and Mucklow, who spent the most time with Cooper, were interviewed on the same night in separate cities, and gave nearly identical descriptions: 5 feet 10 inches (1.78 m) to 5 feet 11 inches (1.80 m) tall, 170 to 180 pounds (77 to 82 kg), mid-40s, with close-set piercing brown eyes and swarthy skin. In 1978, a placard printed with instructions for lowering the aft stairs of a 727 was found by a deer hunter near a logging road about 13 miles (21 km) east of Castle Rock, Washington, well north of Lake Merwin, but within Flight 305's basic flight path. In February 1980, eight-year-old Brian Ingram was vacationing with his family on the Columbia River at a beachfront known as Tina (or Tena) Bar, about 9 miles (14 km) downstream from Vancouver, Washington, and 20 miles (32 km) southwest of Ariel. The child uncovered three packets of the ransom cash as he raked the sandy riverbank to build a campfire. The bills were significantly disintegrated, but still bundled in rubber bands. FBI technicians confirmed that the money was indeed a portion of the ransom: two packets of 100 twenty-dollar bills each, and a third packet of 90, all arranged in the same order as when given to Cooper. In 1986, after protracted negotiations, the recovered bills were divided equally between Ingram and Northwest Orient's insurer; the FBI retained fourteen examples as evidence. Ingram sold fifteen of his bills at auction in 2008 for about $37,000. To date, none of the 9,710 remaining bills have turned up anywhere in the world. Their serial numbers remain available online for public search. The Columbia River ransom money and the airstair instruction placard remain the only confirmed physical evidence from the hijacking ever found outside the aircraft. In 2017, a group of volunteer investigators uncovered what they believe to be “potential evidence, what appears to be a decades-old parachute strap" in the Pacific Northwest. This was followed later in August 2017 with a piece of foam, suspected of being part of Cooper's backpack. In late 2007, the FBI announced that a partial DNA profile had been obtained from three organic samples found on Cooper's clip-on tie in 2001, though they later acknowledged that there is no evidence that the hijacker was the source of the sample material. "The tie had two small DNA samples, and one large sample," said Special Agent Fred Gutt. "It's difficult to draw firm conclusions from these samples." The Bureau also made public a file of previously unreleased evidence, including Cooper's 1971 plane ticket (price: $20.00, paid in cash), and posted previously unreleased composite sketches and fact sheets, along with a request to the general public for information which might lead to Cooper's positive identification. They also disclosed that Cooper chose the older of the two primary parachutes supplied to him, rather than the technically superior professional sport parachute; and that from the two reserve parachutes, he selected a "dummy"—an unusable unit with an inoperative ripcord intended for classroom demonstrations, although it had clear markings identifying it to any experienced skydiver as non-functional. (He cannibalized the other, functional reserve parachute, possibly using its shrouds to tie the money bag shut, and to secure the bag to his body as witnessed by Mucklow.) The FBI stressed that inclusion of the dummy reserve parachute, one of four obtained in haste from a Seattle skydiving school, was accidental. In March 2009, the FBI disclosed that Tom Kaye, a paleontologist from the Burke Museum of Natural History and Culture in Seattle, had assembled a team of "citizen sleuths", including scientific illustrator Carol Abraczinskas and metallurgist Alan Stone. The group, eventually known as the Cooper Research Team, reinvestigated important components of the case using GPS, satellite imagery, and other technologies unavailable in 1971. Although little new information was gained regarding the buried ransom money or Cooper's landing zone, they were able to find and analyze hundreds of minute particles on Cooper's tie using electron microscopy. Lycopodium spores (likely from a pharmaceutical product) were identified, as well as fragments of bismuth and aluminum. In November 2011, Kaye announced that particles of pure (unalloyed) titanium had also been found on the tie. He explained that titanium, which was much rarer in the 1970s than in the 2010s, was at that time found only in metal fabrication or production facilities, or at chemical companies using it (combined with aluminum) to store extremely corrosive substances. The findings suggested that Cooper may have been a chemist or a metallurgist, or possibly an engineer or manager (the only employees who wore ties in such facilities at that time) in a metal or chemical manufacturing plant, or at a company that recovered scrap metal from those types of factories. In January 2017, Kaye reported that rare earth minerals such as cerium and strontium sulfide had also been identified among particles from the tie. One of the rare applications for such elements in the 1970s was Boeing's supersonic transport development project, suggesting the possibility that Cooper was a Boeing employee. Other possible sources of the material included plants that manufactured cathode ray tubes, such as the Portland firms Teledyne and Tektronix. Over the 45-year span of its active investigation, the FBI periodically made public some of its working hypotheses and tentative conclusions, drawn from witness testimony and the scarce physical evidence. Cooper appeared to be familiar with the Seattle area and may have been an Air Force veteran, based on testimony that he recognized the city of Tacoma from the air as the jet circled Puget Sound, and his accurate comment to Mucklow that McChord AFB was approximately 20 minutes' driving time from the Seattle-Tacoma Airport—a detail most civilians would not know, or comment upon. His financial situation was very likely desperate. According to the FBI's retired chief investigator, Ralph Himmelsbach, extortionists and other criminals who steal large amounts of money nearly always do so because they need it urgently; otherwise, the crime is not worth the considerable risk. Alternatively, Cooper may have been "a thrill seeker" who made the jump "just to prove it could be done." Agents theorized that Cooper took his alias from a popular Belgian comic book series of the 1970s featuring the fictional hero Dan Cooper, a Royal Canadian Air Force test pilot who took part in numerous heroic adventures, including parachuting. (One cover from the series, reproduced on the FBI web site, depicts test pilot Cooper skydiving in full paratrooper regalia.) Because the Dan Cooper comics were never translated into English, nor imported to the U.S., they speculated that he may have encountered them during a tour of duty in Europe. The Cooper Research Team suggested the alternative possibility that Cooper was Canadian, and found the comics in Canada, where they were also sold. They noted his specific demand for "negotiable American currency", a phrase seldom if ever used by American citizens; since witnesses stated that Cooper had no distinguishable accent, Canada would be his most likely country of origin if he were not a U.S. citizen. Evidence suggested that Cooper was knowledgeable about technique, aircraft, and the terrain. He demanded four parachutes to force the assumption that he might compel one or more hostages to jump with him, thus ensuring he would not be deliberately supplied with sabotaged equipment. He chose a 727-100 aircraft because it was ideal for a bail-out escape, due to not only its aft airstair but also the high, aftward placement of all three engines, which allowed a reasonably safe jump despite the proximity of the engine exhaust. It had "single-point fueling" capability, a recent innovation that allowed all tanks to be refueled rapidly through a single fuel port. It also had the ability (unusual for a commercial jet airliner) to remain in slow, low-altitude flight without stalling; and Cooper knew how to control its air speed and altitude without entering the cockpit, where he could have been overpowered by the three pilots. In addition, Cooper was familiar with important details, such as the appropriate flap setting of 15 degrees (which was unique to that aircraft), and the typical refueling time. He knew that the aft airstair could be lowered during flight—a fact never disclosed to civilian flight crews, since there was no situation on a passenger flight that would make it necessary—and that its operation, by a single switch in the rear of the cabin, could not be overridden from the cockpit. Some of this knowledge was virtually unique to CIA paramilitary units. In addition to planning his escape, Cooper retrieved the note and wore dark glasses, which indicated that he had a certain level of sophistication in avoiding the things that had aided the identification of the perpetrator of the best-known case of a ransom: the Lindbergh kidnapping. It is not clear how he could have reasonably expected to ever spend the money, fence it at a discount or otherwise profit. Although Cooper made the familiar-from-fiction demand of non-sequentially numbered small bills, mass publicity over the Lindbergh case had long made it public knowledge that even with 1930s technology, getting non-sequential bills in a ransom was no defense against the numbers being logged and used to track down a perpetrator. In the Lindbergh case, fencing what he could as hot money and being very careful with what he did personally pass, the perpetrator had been caught through the ransom money nonetheless, with identification and handwriting evidence brought in only at the trial. Although unconscionably perilous by the high safety, training and equipment standards of skydivers, whether Cooper's jump was virtually suicidal is a matter of dispute. The author of an overview and comparison of World War II aircrew bail-outs with Cooper's drop asserts a probability for his survival, and suggests that like copycat Martin McNally, Cooper lost the ransom during descent. The mystery of how the ransom could have been washed into Tena Bar from any Cooper jump area remains. The Tena Bar find anomalies led one local journalist to suggest Cooper, knowing that he could never spend it, dumped the ransom. According to Kaye's research team, Cooper's meticulous planning may also have extended to the timing of his operation, and even his choice of attire. "The FBI searched but couldn't find anyone who disappeared that weekend," Kaye wrote, suggesting that the perpetrator may have returned to his normal occupation. "If you were planning on going 'back to work on Monday', then you would need as much time as possible to get out of the woods, find transportation and get home. The very best time for this is in front of a four-day weekend, which is the timing Dan Cooper chose for his crime." Furthermore, "if he was planning ahead, he knew he had to hitchhike out of the woods, and it is much easier to get picked up in a suit and tie than in old blue jeans." The Bureau were more skeptical, concluding that Cooper lacked crucial skydiving skills and experience. "We originally thought Cooper was an experienced jumper, perhaps even a paratrooper," said Special Agent Larry Carr, leader of the investigative team from 2006 until its dissolution in 2016. "We concluded after a few years this was simply not true. A Boeing 727 at flaps 15 degrees and light weight probably flies at 150 knots or 172 mph. No experienced parachutist would have jumped in the pitch-black night, in the rain, with a 172 mph wind in his face wearing loafers and a trench coat. It was simply too risky. He also missed that his reserve parachute was only for training and had been sewn shut—something a skilled skydiver would have checked." He also failed to bring or request a helmet, chose to jump with the older and technically inferior of the two primary parachutes supplied to him, and jumped into a probable 15 degrees fahrenheit wind at 10,000 feet in November over Washington state without proper protection against the extreme wind chill. The FBI speculated from the beginning that Cooper did not survive his jump. "Diving into the wilderness without a plan, without the right equipment, in such terrible conditions, he probably never even got his 'chute open," said Carr. Even if he did land safely, agents contended that survival in the mountainous terrain at the onset of winter would have been all but impossible without an accomplice at a predetermined landing point. This would have required a precisely timed jump—necessitating, in turn, cooperation from the flight crew. There is no evidence that Cooper requested or received any such help from the crew, nor that he had any clear idea where he was when he jumped into the stormy, overcast darkness. The 1980 cash discovery launched several new rounds of conjecture and ultimately raised more questions than it answered. Initial statements by investigators and scientific consultants were founded on the assumption that the bundled bills washed freely into the Columbia River from one of its many connecting tributaries. An Army Corps of Engineers hydrologist noted that the bills had disintegrated in a "rounded" fashion and were matted together, indicating that they had been deposited by river action, as opposed to having been deliberately buried. That conclusion, if correct, supported the opinion that Cooper had not landed near Lake Merwin nor any tributary of the Lewis River, which feeds into the Columbia well downstream from Tina Bar. It also lent credence to supplemental speculation (see Later developments above) that placed the drop zone near the Washougal River, which merges with the Columbia upstream from the discovery site. But the "free floating" hypothesis presented its own difficulties; it did not explain the ten bills missing from one packet, nor was there a logical reason that the three packets would have remained together after separating from the rest of the money. Physical evidence was incompatible with geologic evidence: Himmelsbach observed that free-floating bundles would have had to wash up on the bank "within a couple of years" of the hijacking; otherwise the rubber bands would have long since deteriorated, an observation confirmed experimentally by the Cooper Research Team (see Subsequent FBI disclosures above). Geological evidence suggested that the bills arrived at Tina Bar well after 1974, the year of a Corps of Engineers dredging operation on that stretch of the river. Geologist Leonard Palmer of Portland State University found two distinct layers of sand and sediment between the clay deposited on the riverbank by the dredge and the sand layer in which the bills were buried, indicating that the bills arrived long after dredging had been completed. The Cooper Research Team later challenged Palmer's conclusion, citing evidence that the clay layer was a natural deposit. That finding, if true, favors an arrival time of less than one year after the event (based on the rubber band experiment), but does not help to explain how the bundles got to Tina Bar, nor from where they came. Himmelsbach wrote, "I have to confess, if I [were] going to look for Cooper, I would head for the Washougal." The Washougal Valley and its surroundings have been searched repeatedly by private individuals and groups in subsequent years; to date, no discoveries directly traceable to the hijacking have been reported. Some investigators have speculated that the 1980 eruption of Mount St. Helens may have obliterated any remaining physical clues. Alternative theories were advanced. Some surmised that the money had been found at a distant location by someone (or possibly even a wild animal), carried to the riverbank, and reburied there. The sheriff of Cowlitz County proposed that Cooper accidentally dropped a few bundles on the airstair, which then blew off the aircraft and fell into the Columbia River. One local newspaper editor theorized that Cooper, knowing he could never spend the money, dumped it in the river, or buried portions of it at Tena Bar (and possibly elsewhere) himself. No hypothesis offered to date satisfactorily explains all of the existing evidence. In 1976, discussion arose over impending expiration of the statute of limitations on the hijacking. Most published legal analyses agreed that it would make little difference, as interpretation of the statute varies considerably from case to case and court to court, and a prosecutor could argue that Cooper had forfeited immunity on any of several valid technical grounds. The question was rendered irrelevant in November when a Portland grand jury returned an indictment in absentia against "John Doe, aka Dan Cooper" for air piracy and violation of the Hobbs Act. The indictment formally initiated prosecution that can be continued, should the hijacker be apprehended, at any time in the future. In 2003, a Minnesota resident named Lyle Christiansen watched a television documentary about the Cooper hijacking and became convinced that his late brother Kenneth was Cooper. After repeated futile attempts to convince first the FBI, and then the author and film director Nora Ephron (who he hoped would make a movie about the case), he contacted a private investigator in New York City. In 2010 the detective, Skipp Porteous, published a book postulating that Christiansen was the hijacker. The following year, an episode of the History series Brad Meltzer's Decoded also summarized the circumstantial evidence linking Christiansen to the Cooper case. Christiansen reportedly had purchased a house with cash a few months after the hijacking. While dying of cancer in 1994, he told Lyle, "There is something you should know, but I cannot tell you." Lyle said he never pressed his brother to explain. After Christiansen's death, family members discovered gold coins and a valuable stamp collection, along with over $200,000 in bank accounts. They also found a folder of Northwest Orient news clippings which began about the time he was hired in the 1950s, and stopped just prior to the date of the hijacking, despite the fact that the hijacking was by far the most momentous news event in the airline's history. Christiansen continued to work part-time for the airline for many years after 1971, but apparently never clipped another Northwest news story. Research by internet web sleuths would later uncover proof that Christiansen did not pay cash for the house he bought after the hijacking, but instead had a mortgage on the house and took 17 years to pay it off. The same search would also uncover proof that Christiansen had sold off almost two dozen acres of land for $17,000 per acre in the mid 90's, thus accounting for the large sum of money in his account at the time of his death. Despite the publicity generated by Porteous's book and the 2011 television documentary, the FBI is standing by its position that Christiansen cannot be considered a prime suspect. It cites a poor match to eyewitness physical descriptions, a level of skydiving expertise above that predicted by their suspect profile, and an absence of direct incriminating evidence. Coffelt was a con man, ex-convict, and purported government informant who claimed to have been the chauffeur and confidante of Abraham Lincoln's last undisputed descendant, great-grandson Robert Todd Lincoln Beckwith. In 1972 he began claiming he was Cooper, and attempted through an intermediary, a former cellmate named James Brown, to sell his story to a Hollywood production company. He said he landed near Mount Hood, about 50 miles (80 km) southeast of Ariel, injuring himself and losing the ransom money in the process. Photos of Coffelt bear a resemblance to the composite drawings, although he was in his mid-fifties in 1971. He was reportedly in Portland on the day of the hijacking, and sustained leg injuries around that time which were consistent with a skydiving mishap. Coffelt's account was reviewed by the FBI, which concluded that it differed in significant details from information that had not been made public, and was therefore a fabrication. Brown, undeterred, continued peddling the story long after Coffelt died in 1975. Multiple media venues, including the CBS news program 60 Minutes, considered and rejected it. In a 2008 book about Lincoln's descendants, author Charles Lachman revisited Coffelt's tale, although it had been discredited thirty-six years before. L.D. Cooper, a leather worker and Korean War veteran, was proposed as a suspect in July 2011 by his niece, Marla Cooper. As an eight-year-old, she recalled Cooper and another uncle planning something "very mischievous", involving the use of "expensive walkie-talkies", at her grandmother's house in Sisters, Oregon, 150 miles (240 km) south of Portland. The next day flight 305 was hijacked; and though the uncles ostensibly were turkey hunting, L.D. Cooper came home wearing a bloody shirt—the result, he said, of an auto accident. Later, she said, her parents came to believe that L.D. Cooper was the hijacker. She also recalled that her uncle, who died in 1999, was obsessed with the Canadian comic book hero Dan Cooper (see Theories and conjectures), and "had one of his comic books thumbtacked to his wall"—although he was not a skydiver or paratrooper. In August 2011, New York magazine published an alternative witness sketch, reportedly based on a description by Flight 305 eyewitness Robert Gregory, depicting horn-rimmed sunglasses, a "russet"-colored suit jacket with wide lapels, and marcelled hair. The article notes that L.D. Cooper had wavy hair that looked marcelled (as did Duane Weber). The FBI announced that no fingerprints had been found on a guitar strap made by L.D. Cooper. One week later, they added that his DNA did not match the partial DNA profile obtained from the hijacker's tie, but acknowledged, once again, that there is no certainty that the hijacker was the source of the organic material obtained from the tie. The Bureau has made no further public comment. Barbara Dayton, a recreational pilot and University of Washington librarian who was born Robert Dayton in 1926, served in the U.S. Merchant Marine and then the Army during World War II. After discharge, Dayton worked with explosives in the construction industry and aspired to a professional airline career, but could not obtain a commercial pilot's license. Dayton underwent gender reassignment surgery in 1969 and changed her name to Barbara. She claimed to have staged the Cooper hijacking two years later, disguised as a man, in order to "get back" at the airline industry and the FAA, whose insurmountable rules and conditions had prevented her from becoming an airline pilot. She said she hid the ransom money in a cistern near her landing point in Woodburn, a suburban area south of Portland. Eventually she recanted her entire story, ostensibly after learning that she could still be charged with the hijacking. The FBI has never commented publicly on Dayton, who died in 2002. Gossett was a Marine Corps, Army, and Army Air Forces veteran who saw action in Korea and Vietnam. His military experience included advanced jump training and wilderness survival. After retiring from military service in 1973, he worked as an ROTC instructor, taught military law at Weber State University in Ogden, Utah, and hosted a radio talk show in Salt Lake City which featured discussions about the paranormal. He died in 2003. Gossett was widely known to be obsessed with the Cooper hijacking. He amassed a voluminous collection of Cooper-related news articles, and told one of his wives that he knew enough about the case to "write the epitaph for D.B. Cooper". Late in his life he reportedly told three of his sons, a retired Utah judge, and a friend in the Salt Lake City public defender's office that he had committed the hijacking. Photos of Gossett taken circa 1971 bear a close resemblance to the most widely circulated Cooper composite drawing. According to Galen Cook, a lawyer who has collected information related to Gossett for years, Gossett once showed his sons a key to a Vancouver, British Columbia, safe deposit box which, he claimed, contained the long-missing ransom money. Gossett's eldest son, Greg, said that his father, a compulsive gambler who was always "strapped for cash", showed him "wads of cash" just before Christmas 1971, weeks after the Cooper hijacking. He speculated that Gossett gambled the money away in Las Vegas. In 1988, Gossett changed his name to "Wolfgang" and became a Roman Catholic priest, which Cook and others interpreted as an effort to disguise his identity. Other circumstantial evidence includes testimony that Cook claims to have obtained from William Mitchell, a passenger on the hijacked aircraft, regarding a mysterious "physical detail" (which he will not divulge) common to the hijacker and Gossett. Cook also claims to have found "possible links" to Gossett in each of four letters signed by "D.B. Cooper" and mailed to three newspapers within days after the hijacking, although there is no evidence that the actual hijacker created or mailed any of the letters. The FBI has no direct evidence implicating Gossett, and cannot even reliably place him in the Pacific Northwest at the time of the hijacking. "There is not one link to the D.B. Cooper case," said Special Agent Carr, "other than the statements [Gossett] made to someone." Robert Richard Lepsy was a 33-year-old grocery store manager and married father of four from Grayling, Michigan, who disappeared in October 1969. His vehicle was found three days later at a local airport, and a man matching Lepsy's description was reportedly seen boarding a flight to Mexico. Authorities concluded that Lepsy had left voluntarily and closed their investigation. 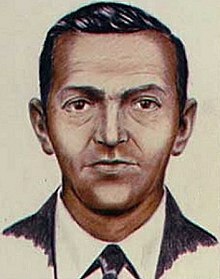 Two years after the Cooper hijacking, family members noted that Lepsy's physical features resembled those in the Cooper composite drawings, and asserted that Cooper's clothing was described as very similar to Lepsy's grocery store uniform. Lepsy was declared legally dead in 1976. One of Lepsy's daughters submitted a DNA sample to the FBI in 2011, with unknown results. Although Lepsy was proposed as a Cooper suspect in a 2014 book, there is no record of public comment on him from the FBI. List was an accountant, World War II and Korean War veteran who murdered his wife, three teenage children, and 85-year-old mother in Westfield, New Jersey, fifteen days before the Cooper hijacking, withdrew $200,000 from his mother's bank account, and disappeared. He came to the attention of the Cooper task force due to the timing of his disappearance, multiple matches to the hijacker's description, and the reasoning that "a fugitive accused of mass murder has nothing to lose." After his capture in 1989, List admitted to murdering his family, but denied any involvement in the Cooper hijacking. Although his name continues to crop up in Cooper articles and documentaries, no substantial evidence implicates him, and the FBI no longer considers him a suspect. He died in prison in 2008. Theodore E. Mayfield was a Special Forces veteran, pilot, competitive skydiver, and skydiving instructor who served time in 1994 for negligent homicide after two of his students died when their parachutes failed to open. Later, he was found indirectly responsible for thirteen additional skydiving deaths due to faulty equipment and training. His criminal record also included armed robbery and transportation of stolen aircraft. In 2010, he was sentenced to three years' probation for piloting a plane 26 years after losing his pilot's license and rigging certificates. 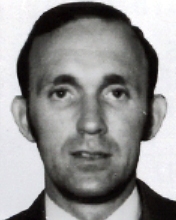 He was suggested repeatedly as a suspect early in the investigation, according to FBI Agent Ralph Himmelsbach, who knew Mayfield from a prior dispute at a local airport. He was ruled out, based partly on the fact that he called Himmelsbach less than two hours after Flight 305 landed in Reno to volunteer advice on standard skydiving practices and possible landing zones. In 2006, two amateur researchers named Daniel Dvorak and Matthew Myers proposed Mayfield as a suspect once again, asserting that they had assembled a convincing circumstantial case. They theorized that Mayfield called Himmelsbach not to offer advice, but to establish an alibi; and they challenged Himmelsbach's conclusion that Mayfield could not possibly have found a phone in time to call the FBI less than four hours after jumping into the wilderness at night. Mayfield denied any involvement, and repeated a previous assertion that the FBI called him five times while the hijacking was still in progress to ask about parachutes, local skydivers, and skydiving techniques. (Himmelsbach said the FBI never called Mayfield.) Mayfield further charged that Dvorak and Myers asked him to play along with their theory, and "we'll all make a lot of money". Dvorak and Myers called any inference of collusion a "blatant lie". The FBI offered no comment beyond Himmelsbach's original statement that Mayfield, who died in 2015, was ruled out as a suspect early on. Main article: Richard McCoy, Jr.
McCoy was an Army veteran who served two tours of duty in Vietnam, first as a demolition expert, and later, with the Green Berets as a helicopter pilot. After his military service he became a warrant officer in the Utah National Guard and an avid recreational skydiver, with aspirations, he said, of becoming a Utah State Trooper. On April 7, 1972, McCoy staged the best-known of the so-called "copycat" hijackings (see below). He boarded United Airlines' Flight 855 (a Boeing 727 with aft stairs) in Denver, Colorado, and brandishing what later proved to be a paperweight resembling a hand grenade and an unloaded handgun, he demanded four parachutes and $500,000. After delivery of the money and parachutes at San Francisco International Airport, McCoy ordered the aircraft back into the sky and bailed out over Provo, Utah, leaving behind his handwritten hijacking instructions and his fingerprints on a magazine he had been reading. Later, a handwriting expert compared the note found on the plane with McCoy’s writing on military service records and determined that McCoy had written the note. He was arrested on April 9 with the ransom cash in his possession, and after trial and conviction, received a 45-year sentence. Two years later he escaped from Lewisburg Federal Penitentiary with several accomplices by crashing a garbage truck through the main gate. Tracked down three months later in Virginia Beach, McCoy was killed in a shootout with FBI agents. In their 1991 book, D.B. Cooper: The Real McCoy, parole officer Bernie Rhodes and former FBI agent Russell Calame asserted that they had identified McCoy as Cooper. They cited obvious similarities in the two hijackings, claims by McCoy's family that the tie and mother-of-pearl tie clip left on the plane belonged to McCoy, and McCoy's own refusal to admit or deny that he was Cooper. A proponent of their theory was the FBI agent who killed McCoy. "When I shot Richard McCoy," he said, "I shot D. B. Cooper at the same time." Although there is no reasonable doubt that McCoy committed the Denver hijacking, the FBI does not consider him a suspect in the Cooper case because of significant mismatches in age and description; a level of skydiving skill well above that thought to be possessed by the hijacker; and credible evidence that McCoy was in Las Vegas on the day of the Portland hijacking, and at home in Utah the day after, having Thanksgiving dinner with his family. FBI sketch of D.B. Cooper from 1971 (left) compared to 1970 Army ID picture of Robert Rackstraw. Law enforcement expert found nine points of match between the two. Robert Wesley Rackstraw is a retired pilot and ex-convict who served on an army helicopter crew and other units during the Vietnam War. He came to the attention of the Cooper task force in February 1978, after he was arrested in Iran and deported to the U.S. to face explosives possession and check kiting charges. Several months later, while released on bail, Rackstraw attempted to fake his own death by radioing a false mayday call and telling controllers that he was bailing out of a rented plane over Monterey Bay. Police later arrested him in Fullerton on an additional charge of forging federal pilot certificates; the plane he claimed to have ditched was found, repainted, in a nearby hangar. Cooper investigators noted his physical resemblance to Cooper composite sketches, although he was only 28 in 1971, military parachute training, and criminal record, but eliminated him as a suspect in 1979 after no direct evidence of his involvement could be found. In 2016, Rackstraw re-emerged as a suspect in a History Channel program and a book. On September 8, 2016, Thomas J. Colbert, an author of the book The Last Master Outlaw, filed a lawsuit to compel the FBI to release its Cooper case file under the Freedom of Information Act. The suit alleges that the FBI suspended active investigation of the Cooper case "in order to undermine the theory that Rackstraw is D.B. Cooper so as to prevent embarrassment for the bureau's failure to develop evidence sufficient to prosecute him for the crime." In January 2018, a small cold case documentary team reported that they had obtained a letter originally written in December 1971 and sent to The New York Times, the Los Angeles Times, The Seattle Times and The Washington Post, with numerous numbers and letters written on it. The team, led by Tom and Dawna Colbert, says that the codes were deciphered and matched to three units Rackstraw was a part of while in the Army, and the FBI refused to acknowledge the findings because "it would have to admit that amateur sleuths had cracked a case the bureau couldn't." One of the Flight 305 flight attendants reportedly "did not find any similarities" between photos of Rackstraw from the 1970s and her recollection of Cooper's appearance. Rackstraw's attorney called the renewed allegations "the stupidest thing I've ever heard", and Rackstraw himself told People.com, "It's a lot of [expletive], and they know it is." The FBI declined further comment. Rackstraw stated in a 2017 phone interview that he lost his job over the 2016 investigations. A June 2018 article circulated claiming private investigators "decoded" a previously publicly unknown letter on file with the FBI, which purportedly includes a disguised confession. Walter R. Reca (born Walter R. Peca) was a Michigan native, a military veteran and original member of the Michigan Parachute Team. He was proposed as a suspect by his friend Carl Laurin, a former commercial airline pilot and expert parachuter himself, at a press conference on May 17, 2018. In 2008, Reca confessed to being D.B. Cooper to Laurin via a recorded phone call. In July 2018, Principia Media released a four-part documentary detailing their investigation. Reca gave Laurin permission in a notarized letter to share his story after he passed away in 2014, aged 80. He also allowed Laurin to tape their phone conversations about the crime over a six week period in late 2008. In the over three hours of recordings, Reca gave new details about the hijacking that the public had not heard before. He also confessed to his niece, Lisa Story. Using his years of training to determine the location of the jump, Laurin concluded that D.B. Cooper landed near Cle Elum, Washington. According to written testimony, Jeff Osiadacz, a Cle Elum, Washington native, was driving his dump truck near Cle Elum the night of November 24, 1971, when he saw a man walking down the side of the road in the inclement weather. He assumed the man's car had broken down and was walking to get assistance. However he did not have room in his truck to pick him up. He continued toward his destination, the Teanaway Junction Café just outside of Cle Elum. After ordering coffee, the man from the side of the road also entered the café looking like a "drowned rat", according to Osiadacz. The man sat next to him and asked if he would be able to give his friend directions if he called him on the phone. Osiadacz agreed to this and spoke with the man's friend, giving him directions to the café. Shortly after that, Osiadacz left for the Grange Hall to play in a band. The man offered to pay for his coffee, and the two amicably parted. Laurin began his search for the witness, after Reca described the landscape he saw while on his way to the drop zone: two bridges, some distinct lights; and his description of the exterior and interior of the café, as well as his encounter with Osiadacz. He described Osiadacz in detail, recalling that he was wearing western gear and had a guitar case. He dubbed him "Cowboy". Laurin consulted a map to find these particular landmarks and began making phone calls about the "Cowboy who had driven a dump truck." Laurin was put in contact with Osiadacz, who recalled meeting a man that night, described what he was wearing and what he looked like, and confirmed his identity as Reca after seeing a photo Laurin sent him. In addition to the taped confession, Laurin also has a confession written by Reca and long underwear allegedly worn by Reca under his black pants during the hijacking. In 2016, Laurin took the information to publisher Principia Media, who consulted with Joe Koenig, a forensic linguist. He evaluated all documents, including passports, identification cards, photographs, and newspaper clippings. Koenig found no evidence of tampering or manipulation and deemed all documentation authentic and contemporaneous. After comparing Laurin's research to the available FBI records, he found no discrepancies that eliminated Reca as a suspect. He also thought it particularly significant that Osiadacz's statement of events on the night of November 24, 1971, was identical to the account that Reca made five years earlier. Koenig publicly stated at the Principia Media press conference on May 17, 2018, that he believes that Walter R. Reca was D.B. Cooper. On January 8, 2019, Koenig published a book on Cooper, titled "Getting the Truth". The Oregonian article states that particles such as aluminum spiral chips found on the clip-on tie could have come from a locomotive maintenance facility. Furthermore, it states that Smith’s information about the Seattle area may have come from his close friend from the railroad, Dan Clair, who was stationed at Fort Lewis during World War II. Smith and Clair worked together in Newark, New Jersey, at the Oak Island Yard, with Smith retiring as a Yardmaster for Conrail. The article also noted that a website devoted to the Lehigh Valley Railroad contained a picture of Smith, and stated that “the resemblance to the wanted-poster sketches was remarkable.” The FBI responded to media requests on Smith by saying it would be “inappropriate” to comment about specific suspects. Duane L. Weber was a World War II Army veteran who served time in at least six prisons from 1945 to 1968 for burglary and forgery. He was proposed as a suspect by his widow, based primarily on a deathbed confession: Three days before he died in 1995, Weber told his wife, "I am Dan Cooper." The name meant nothing to her, she said; but months later, a friend told her of its significance in the hijacking. She went to her local library to research D.B. Cooper, found Max Gunther's book, and discovered notations in the margins in her husband's handwriting. She then recalled, in retrospect, that Weber once had a nightmare during which he talked in his sleep about jumping from a plane, leaving his fingerprints on the "aft stairs". He also reportedly told her that an old knee injury had been incurred by "jumping out of a plane". Like the hijacker, Weber drank bourbon and chain smoked. Other circumstantial evidence included a 1979 trip to Seattle and the Columbia River, during which Weber took a walk alone along the river bank in the Tina Bar area; four months later Brian Ingram made his ransom cash discovery in the same area. The FBI eliminated Weber as an active suspect in July 1998 when his fingerprints did not match any of those processed in the hijacked plane, and no other direct evidence could be found to implicate him. Later, his DNA also failed to match the samples recovered from Cooper's tie, though the bureau has since conceded that they cannot be certain that the organic material on the tie came from Cooper. Garrett Brock Trapnell hijacked a TWA airliner en route from Los Angeles to New York City in January. He demanded $306,800 in cash, the release of Angela Davis, and an audience with President Richard Nixon. After the aircraft landed at John F. Kennedy International Airport, he was shot and wounded by FBI agents, then arrested. Richard Charles LaPoint, an Army veteran and "New England beach bum", boarded Hughes Airwest Flight 800 at McCarran airport in Las Vegas on January 20. Brandishing what he claimed was a bomb while the DC-9 was on the taxiway, he demanded $50,000, two parachutes, and a helmet. After releasing the passengers and two flight attendants, he ordered the plane on an eastward trajectory toward Denver, then bailed out over the treeless plains of northeastern Colorado. Authorities, tracking the locator-equipped parachute and his footprints in the snow and mud, apprehended him a few hours later. Richard McCoy, Jr., a former Army Green Beret, hijacked a United Airlines 727-100 in April after it left Denver, Colorado, diverted it to San Francisco, then bailed out over Utah with $500,000 in ransom money. He landed safely, but was arrested two days later. Frederick Hahneman used a handgun to hijack an Eastern Air Lines 727 in Allentown, Pennsylvania, in May, demanded $303,000, and eventually parachuted into Honduras, his country of birth. A month later, with the FBI in pursuit and a $25,000 bounty on his head, he surrendered at the American Embassy in Tegucigalpa. Robb Dolin Heady, a paratrooper and Vietnam veteran, stormed a United Airlines 727 in Reno in early June, extorted $200,000 and two parachutes, and jumped into darkness near Washoe Lake, about 25 miles (40 km) south of Reno. Police found Heady's car (sporting a United States Parachute Association bumper sticker) parked near the lake and arrested him as he returned to it the next morning. Martin McNally, an unemployed service-station attendant, used a submachine gun in late June to commandeer an American Airlines 727 en route from St. Louis to Tulsa, then diverted it eastward to Indiana and bailed out with $500,000 in ransom. McNally lost the ransom money as he exited the aircraft, but landed safely near Peru, Indiana, and was apprehended a few days later in a Detroit suburb. In all, 15 hijackings similar to Cooper's—all unsuccessful—were attempted in 1972. With the advent of universal luggage searches in 1973 (see Airport security), the general incidence of hijackings dropped dramatically. There were no further notable Cooper imitators until July 11, 1980, when Glenn K. Tripp seized Northwest flight 608 at Seattle-Tacoma Airport, demanding $600,000 ($100,000 by an independent account), two parachutes, and the assassination of his boss. However, a quick-thinking flight attendant had secretly drugged Tripp's alcoholic beverage with Valium. After a 10-hour standoff, during which Tripp reduced his demands to three cheeseburgers and a head-start on getting away, he was apprehended. But on January 21, 1983—while still on probation—he hijacked the same Northwest flight, this time en route, and demanded to be flown to Afghanistan. When the plane landed in Portland, he was shot and killed by FBI agents. The Cooper hijacking marked the beginning of the end for unfettered and unscrutinized commercial airline travel. Despite the initiation of the federal Sky Marshal Program the previous year, 31 hijackings were committed in U.S. airspace in 1972; 19 of them were for the specific purpose of extorting money and most of the rest were attempts to reach Cuba. In 15 of the extortion cases the hijackers also demanded parachutes. In early 1973 the FAA began requiring airlines to search all passengers and their bags. Amid multiple lawsuits charging that such searches violated Fourth Amendment protections against search and seizure, federal courts ruled that they were acceptable when applied universally, and when limited to searches for weapons and explosives. In contrast to the 31 hijackings in 1972, only two were attempted in 1973, both by psychiatric patients, one of whom intended to crash the airliner into the White House to kill President Nixon. In the wake of multiple "copycat" hijackings in 1972, the FAA required that all Boeing 727 aircraft be fitted with a device, later dubbed the "Cooper vane", that prevents lowering of the aft airstair during flight. As a direct result of the hijacking, the installation of peepholes was mandated in all cockpit doors. This made it possible for the cockpit crew to observe people in the passenger cabin without having to open the cockpit door. In 1978 the hijacked 727-100 aircraft was sold by Northwest to Piedmont Airlines where it was re-registered N838N and continued in domestic carrier service. In 1984 it was purchased by the now-defunct charter company Key Airlines, re-registered N29KA, and incorporated into the Air Force's civilian charter fleet that shuttled workers between Nellis Air Force Base and the Tonopah Test Range during the top-secret F-117 Nighthawk development program. In 1996 the aircraft was scrapped for parts in a Memphis boneyard. In late April 2013, Earl Cossey – the owner of the skydiving school that furnished the four parachutes that were given to Cooper – was found dead in his home in Woodinville, a suburb of Seattle. His death was ruled a homicide due to blunt-force trauma to the head. The perpetrator remains unknown. Some commenters alleged possible links to the Cooper case, but authorities responded that they have no reason to believe that any such link exists. Woodinville officials later announced that burglary was most likely the motive for the crime. Himmelsbach famously called Cooper a "rotten sleazy crook" but his bold and adventurous crime inspired a cult following that was expressed in song, film, and literature. Restaurants and bowling alleys in the Pacific Northwest hold regular Cooper-themed promotions and sell tourist souvenirs. A "Cooper Day" celebration has been held at the Ariel General Store and Tavern each November since 1974 with the exception of 2015, the year its owner, Dona Elliot, died. Cooper has appeared in the story lines of the television series Prison Break, The Blacklist, NewsRadio, Leverage, Journeyman and Numb3rs, the 1981 film The Pursuit of D. B. Cooper, the 2004 film Without a Paddle, and a book titled The Vesuvius Prophecy, based on The 4400 TV series. ↑ Grossweiler, Ed (November 26, 1971). "Hijacker bails out with loot". Free Lance-Star. (Fredericksburg, Virginia). Associated Press. p. 1. ↑ "Wilderness area combed for parachute skyjacker". The Bulletin. (Bend, Oregon). UPI. November 26, 1971. p. 1. 1 2 3 4 5 6 7 8 9 10 11 12 13 14 15 16 Gray, Geoffrey (October 21, 2007). "Unmasking D.B. Cooper". New York magazine. ISSN 0028-7369. Retrieved April 24, 2011. ↑ Himmelsbach & Worcester 1986, p. 135. 1 2 3 4 5 6 7 Pasternak, Douglas (July 24, 2000). "Skyjacker at large". U.S. News & World Report. 129 (4): 72–73. ISSN 0041-5537. 1 2 3 4 5 "D.B. Cooper Redux: Help Us Solve the Enduring Mystery". December 31, 2007. Retrieved April 24, 2011. 1 2 3 Seven, Richard (November 17, 1996). "D.B. Cooper – Perfect Crime or Perfect Folly?". The Seattle Times. Retrieved April 24, 2011. ↑ "F.B.I. makes new bid to find 1971 skyjacker". The San Francisco Chronicle. Associated Press. January 2, 2008. Archived from the original on January 2, 2008. Retrieved January 2, 2008. ↑ McNerthney, Casey (2016-07-12). "D.B. Cooper case no longer actively investigated by FBI". KIRO7. Retrieved July 12, 2016. ↑ Olson, James S. (1999). Historical Dictionary of the 1970s. Westport, Connecticut: Greenwood Press. p. 107. ISBN 978-0-313-30543-6. ↑ History's Greatest Unsolved Crimes. Frances Farmer Archive Archived June 24, 2016, at the Wayback Machine Archived June 24, 2016, at the Wayback Machine Retrieved February 7, 2011. ↑ Gunther 1985, p. 32. ↑ Smoking was permitted on commercial aircraft until 1988. ↑ Tizon, Tomas A. (September 4, 2005). "D.B. Cooper – the search for skyjacker missing since 1971". San Francisco Chronicle. Retrieved January 2, 2008. ↑ "Hijacked plane makes landing at Seattle airport". Spokesman-Review. (Spokesman-Review). Associated Press. November 25, 1971. p. 1. ↑ Bragg, Lynn E. (2005). Myths and Mysteries of Washington. Guilford, Connecticut: Globe Pequot. p. 2. ISBN 978-0-7627-3427-6. ↑ Steven, Richard (November 24, 1996). "When D.B. Cooper Dropped From Sky: Where did the daring, mysterious skyjacker go? Twenty-five years later, the search is still on for even a trace". The Philadelphia Inquirer. p. A20. ↑ Unmasking D.B. Cooper. New York Magazine retrieved June 28, 2016. 1 2 D.B. Cooper. crimemuseum.org, retrieved June 28, 2016. ↑ Himmelsbach & Worcester 1986, p. 13. ↑ The D.B. Cooper Mystery. FBI.gov, retrieved June 28, 2016. ↑ Transcript of Crew Communications Retrieved February 25, 2011. ↑ According to most sources, Cooper directed that the ransom be supplied in the form of 20-dollar bills; but Himmelsbach, who was present when the demands were first received, wrote that he specified only "negotiable American currency, denomination not important." (Himmelsbach & Worcester 1986, p. 18) All sources agree that the ransom was supplied in the form of 20-dollar bills. 1 2 Himmelsbach & Worcester 1986, p. 18. ↑ Himmelsbach & Worcester 1986, p. 20. ↑ Himmelsbach & Worcester 1986, p. 19. ↑ Himmelsbach & Worcester 1986, p. 22. 1 2 "D B Cooper's Loot Serial Number Searcher". Check-six.com. October 19, 2010. Retrieved November 29, 2010. ↑ Himmelsbach & Worcester 1986, p. 25. ↑ Gunther 1985, p. 43. ↑ "Mystery: D. B. Cooper". Unsolved Mysteries. Series 1. Episode 2. October 12, 1988. NBC. ↑ Himmelsbach & Worcester 1986, p. 28. ↑ Rothenberg and Ulvaeus, p. 5. ↑ Gunther 1985, p. 45. ↑ Himmelsbach & Worcester 1986, pp. 33–34. ↑ Rothenberg, David; Ulvaeus, Marta (1999). The New Earth Reader: The Best of Terra Nova. Cambridge, Massachusetts: MIT Press. p. 4. ISBN 978-0-262-18195-2. ↑ Himmelsbach & Worcester 1986, p. 32. ↑ Himmelsbach & Worcester 1986, p. 36. 1 2 3 Gunther 1985, p. 53. ↑ "Top Ten Famous disappearances". Time. ↑ Gunther 1985, p. 56. ↑ Gunther 1985, pp. 58, 66. 1 2 Bragg, p. 4. ↑ Himmelsbach & Worcester 1986, p. 48. ↑ Cowan, James (January 3, 2008). "F.B.I. reheats cold case". National Post. Archived from the original on January 21, 2008. Retrieved January 9, 2008. ↑ Motaher, Maria. "D.B. Cooper Hijacking". Federal Bureau of Investigation. Retrieved 7 December 2018. ↑ Browning, W. (July 22, 2016). One mystery solved in 'D.B. Cooper' skyjacking fiasco. Columbia Journalism Review, retrieved July 29, 2016. ↑ D B Cooper was not really D B Cooper? India Today, retrieved July 29, 2016. ↑ Guzman, Monica (November 27, 2007). Update: Everyone wants a piece of the D. B. Cooper legend. Seattle Post-Intelligencer archive Retrieved February 25, 2011. ↑ Browning, William (July 18, 2016). "A reporter's role in the notorious unsolved mystery of 'D.B. Cooper'". Columbia Journalism Review. New York. Retrieved July 19, 2016. ↑ Gunther 1985, p. 55. 1 2 3 4 5 6 7 8 9 "D.B. Cooper: Help Us Solve the Enduring Mystery". FBI. December 31, 2007. Archived from the original on February 11, 2009. Retrieved February 5, 2009. ↑ Gunther 1985, p. 68. ↑ Taylor, Michael (November 24, 1996). "D.B. Cooper legend still up in air 25 years after leap, hijackers prompts strong feelings". San Francisco Chronicle. ↑ Himmelsbach & Worcester 1986, p. 47. ↑ Himmelsbach & Worcester 1986, pp. 80–81. ↑ Topographic map, northern half of primary search area Retrieved February 25, 2011. ↑ Topographic map, southern half of primary search area Retrieved February 25, 2011. ↑ Himmelsbach & Worcester 1986, pp. 67–68. ↑ "Aeronautical Information Manual". Federal Aviation Administration. Archived from the original on July 21, 2011. Retrieved August 10, 2011. ↑ Nuttall 2010, pp. 90–91. ↑ Himmelsbach & Worcester 1986, p. 71. ↑ Olson 2010, p. 34. ↑ Himmelsbach & Worcester 1986, pp. 101–104. ↑ Himmelsbach & Worcester 1986, p. 86. ↑ Himmelsbach & Worcester 1986, pp. 87–89. 1 2 3 4 D.B. Cooper: A Timeline (October 2007) New York Magazine Archives Retrieved February 10, 2011. ↑ FBI files on Fleming case, released via Freedom of Information Act Retrieved February 15, 2011. ↑ Himmelsbach & Worcester 1986, p. 95. ↑ Gunther 1985, p. 184. ↑ Himmelsbach & Worcester 1986, pp. 111–113. ↑ Himmelsbach & Worcester 1986, pp. 114–116. ↑ "DB Cooper Vault". Federal Bureau of Investigation. Retrieved July 26, 2018. ↑ "Update on Investigation of 1971 Hijacking by D.B. Cooper". Federal Bureau of Investigation. Retrieved July 12, 2016. 1 2 "It's an Enigma." JCS-Group.com Recovered January 31, 2011. ↑ Himmelsbach & Worcester 1986, p. 108. ↑ Orzano, M (July 21, 2014). D.B. Cooper skyjacking: 8-year-old Washington boy first to unearth ransom notes from 1971 incident. coinworld.com, retrieved August 29, 2015. ↑ "FBI Freedom of Information Act documents, part 7, pp. 10–12" (PDF). Archived from the original (PDF) on July 21, 2011. Retrieved April 23, 2011. ↑ Associated Press (May 22, 1986). Boy to Split $5,520 of D. B. Cooper's Loot. LA Times archive Retrieved March 6, 2011. ↑ Six Years Later Brian Ingram Gets a Piece of D.B. Cooper's Hijack Haul (June 23, 1986). People Magazine archive Retrieved February 28, 2011. ↑ "D.B. Cooper Skyjacking Cash Sold in Dallas Auction". Fox News. Associated Press. June 13, 2009. Retrieved June 14, 2008. 1 2 3 4 5 6 "In Search of D.B. Cooper: New Developments in the Unsolved Case". F.B.I. Headline Archives. March 17, 2009. Archived from the original on January 17, 2011. Retrieved January 22, 2011. ↑ Chamberlain, Samuel (2017-08-09). "DB Cooper mystery: 'Potential' physical evidence uncovered in search". Fox News. Fox News. Retrieved August 11, 2017. ↑ Cerullo, Megan. "FBI accepts new evidence in D.B. Cooper hijacking cold case". New York Daily News. New York Daily News. 1 2 Ingalls, Chris (November 1, 2007). "Investigators: F.B.I. unveils new evidence in D.B. Cooper case". King 5. Archived from the original on January 5, 2008. Retrieved March 11, 2008. ↑ "Interview with lead FBI Investigator Larry Carr". Steven Rinehart. February 2, 2008. Retrieved February 2, 2008. ↑ Gunther 1985, p. 40. 1 2 "Home - Citizen Sleuths". 1 2 3 4 Research Conclusions: Cooper Research Team web site Archived November 25, 2011, at the Wayback Machine Archived November 25, 2011, at the Wayback Machine. Retrieved August 28, 2014. ↑ Scientists say they may have new evidence in D.B. Cooper case. USA Today (January 13, 2017), retrieved January 16, 2017. ↑ New evidence: Was DB Cooper a Boeing employee? King5.com, retrieved January 16, 2017. ↑ "D.B. Cooper could have worked at Portland-area tech firm, scientists say". ↑ Tedford, Deborah (January 2, 2008). "F.B.I. Seeks Help in Solving Skyjacking Mystery". National Public Radio. Retrieved March 11, 2008. ↑ Himmelsbach & Worcester 1986, p. 96. 1 2 Himmelsbach & Worcester 1986, p. 115. ↑ Gunther 1985, p. 44. ↑ Gunther 1985, p. 46. ↑ Gunther 1985, p. 136. ↑ Himmelsbach & Worcester 1986, p. 43. ↑ "The Lindbergh Case: How Bankers Helped Solve It". Acamstoday. ↑ Martin Andrade Jr, MBA (December 1, 2014). "Survival Probability Analysis of the D.B. Cooper Hijacking, using Historical Parachuting Data" (PDF). Martinandrade.files. 1 2 Gunther 1985, p. 203. ↑ Gunther 1985, p. 15. ↑ Johnson, Gene (November 25, 2011). "D.B. Cooper enigma still fascinates". USA Today. Associated Press. Retrieved August 27, 2012. ↑ In Search of D.B. Cooper: New Developments in the Unsolved Case (March 17, 2009). FBI.gov Retrieved November 9, 2016. 1 2 Himmelsbach & Worcester 1986, p. 110. ↑ Himmelsbach & Worcester 1986, pp. 110–111. ↑ "FBI Freedom of Information Act documents, part 7, p. 15" (PDF). Archived from the original (PDF) on July 21, 2011. Retrieved April 23, 2011. ↑ "Cash linked to 'D.B. Cooper' up for auction". MSNBC. March 31, 2008. Retrieved March 31, 2008. ↑ Palmer Report: Cooper Research Team web site. Retrieved May 9, 2015. ↑ Connolly, P. (November 24, 1981). D.B. Cooper: A stupid rascal. The Free Lance-Star, retrieved June 29, 2016. 1 2 Gunther 1985, p. 179. ↑ CRS Report for Congress: Statutes of Limitation in Federal Criminal Cases: An Overview. FAS.org Retrieved March 6, 2011. ↑ Denson, Bryan (November 24, 1996). D.B. Cooper legend lives. Oregon Live archive Retrieved March 6, 2011. ↑ Porteous & Blevins 2010. ↑ "D.B. Cooper". Brad Meltzer's Decoded. Season 1. Episode 6. January 6, 2011. History. ↑ McShane, Larry (September 2, 2011). "Tina Mucklow, D.B. Cooper-hijacking flight attendant found; Woman was go-between for Cooper, crew". Daily News. New York. 1 2 3 4 "FBI working new lead in D.B. Cooper hijacking case". CNN. August 1, 2011. Retrieved August 1, 2011. ↑ "F.B.I. rejects latest D.B. Cooper suspect". Seattle Post-Intelligencer. Associated Press. October 26, 2007. Retrieved March 11, 2008. ↑ "Has The Mystery of D.B. Cooper Been Solved?". InsideEdition.com. October 6, 2008. Archived from the original on March 8, 2012. Retrieved March 8, 2011. ↑ Himmelsbach & Worcester 1986, pp. 83–84. ↑ Himmelsbach & Worcester 1986, pp. 121–122. ↑ Lachman, Charles (2008). The Last Lincolns: The Rise & Fall of a Great American Family. Union Square Press. ISBN 1-4027-5890-1. ↑ Provano, Joel (August 3, 2011): Woman claims D.B. Cooper was her uncle. AJC.com Retrieved August 3, 2011. ↑ Alex Hannaford (July 30, 2011). "The 40-year mystery of America's greatest skyjacking – Telegraph". London: Daily Telegraph. Retrieved July 30, 2011. ↑ Berkes, Howard (2011). "FBI Says It Has 'A New Suspect' In D.B. Cooper Skyjacking Case: The Two-Way : NPR". npr.org. Retrieved August 1, 2011. ↑ Thomas, P and Cloherty, J (August 3, 2011): "D.B. Cooper Exclusive: Did Niece Provide Key Evidence?" ABCNews.com Retrieved August 3, 2011. ↑ Gray, Geoffrey. "DNA Test Negative for D.B. Cooper Suspect; a New Sketch Emerges". Crime Library. Retrieved December 31, 2012. ↑ McNerthney, Casey (August 1, 2011). "No fingerprints found on item in D.B. Cooper case". seattlepi.com. Retrieved August 2, 2011. ↑ Pat Forman, Ron Forman (2008). The Legend of D B Cooper. Lulu.com. ISBN 9781605520148. ↑ Olson 2010, pp. 72–73. 1 2 Craig, John S. "D.B. Cooper Suspect Named: William Pratt Gossett," associatedcontent.com. 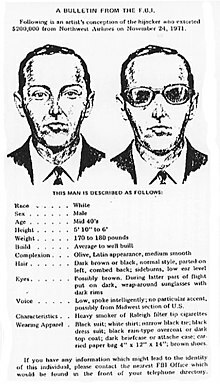 1 2 Yet Another D. B. Cooper Suspect: William Pratt "Wolfgang" Gossett. Crime Slam Archived July 8, 2011, at the Wayback Machine Archived July 8, 2011, at the Wayback Machine Retrieved February 1, 2011. ↑ Photos of Gossett, 1967–73 Retrieved February 2, 2011. ↑ "U.S. lawyer believes notorious fugitive D.B. Cooper hid ransom money in Vcr bank". Canadian Press. August 3, 2008. ↑ "Investigator Claims Depoe Bay Man Was Infamous 'D.B. Cooper'". Depoe Bay Beacon. May 28, 2008. ↑ Craig, John S. "1971 D.B. Cooper Letters Linked to Suspect William Gossett," associatedcontent.com. ↑ "Letter to Gazette Checked in FBI Hunt for Skyjacker". Reno Evening Gazette. November 29, 1971. Retrieved December 26, 2015. ↑ "Words in 'Skyjacker Note' to Gazette Clipped from Modesto Bee, FBI Told". Reno Evening Gazette. November 30, 1971. ↑ "Gazette Receives Hijacker 'Letter' – Second in a Week". Reno Evening Gazette. December 3, 1971. ↑ "Was D.B. Cooper an Ogden Resident?" (July 28, 2008) Deseret News (Salt Lake City) via Associated Press. Retrieved February 1, 2011. ↑ "Episode 7: Richard Lepsy – Thin Air Podcast". thinairpodcast.com. Retrieved March 8, 2017. ↑ "Robert Richard Lepsy". Charley Project. Archived from the original on March 8, 2017. Retrieved March 8, 2017. ↑ TEGNA. "Could missing man from Grayling, Mich. be D.B. Cooper?". WZZM. Retrieved March 8, 2017. ↑ "Has the mystery of DB Cooper been solved?". Telegraph.co.uk. Retrieved March 8, 2017. ↑ "Suspect in Family-Slaying May Be Famed D.B. Cooper". Los Angeles Times. June 30, 1989. p. A1. 1 2 Coreno, Catherine (October 22, 2007). "D.B. Cooper: A Timeline". New York. Retrieved January 10, 2008. ↑ Benford, Timothy B.; Johnson, James P. (2000). Righteous Carnage: The List Murders in Westfield. Lincoln, Nebraska: iUniverse. pp. 76–77. ISBN 978-0-595-00720-2. ↑ McCracken, Elizabeth (December 28, 2008). "Wanted: A Killer Disappears Into Another Life". The New York Times. Retrieved September 9, 2014. ↑ Stout, David (March 25, 2008). "John E. List, 82, Killer of 5 Family Members, Dies". The New York Times. Retrieved May 30, 2008. 1 2 3 4 Smith, BA (August 15, 2015). DB Cooper suspect, Ted Mayfield, killed in aviation accident. The Mountain News, retrieved October 4, 2015. ↑ McCowan, Karen (January 20, 2010). Illegal flight lands pilot in trouble once again. Register-Guard archive Retrieved February 24, 2011. 1 2 Himmelsbach & Worcester 1986, p. 51. 1 2 3 D.B. Cooper Inside Edition segment (2007) on YouTube Retrieved February 24, 2011. ↑ Himmelsbach & Worcester 1986, p. 52. ↑ "The Real McCoy". Time. April 24, 1972. Retrieved July 26, 2007. 1 2 "Skydiver Held as Hijacker; $500,000 Is Still Missing". The New York Times. Associated Press. April 10, 1972. p. 1. Retrieved August 4, 2018. 1 2 3 4 Krajicek, David. "The D.B. Cooper Story: The Copycats". Crime Library. Archived from the original on January 2, 2008. Retrieved January 3, 2008. ↑ Motaher, Maria. "Richard Floyd McCoy, Jr". Federal Bureau of Investigation. Retrieved 7 December 2018. ↑ "Widow of Man Linked in Book to Skyjacker D.B. Cooper Sues Authors, Provo Attorney". Associated Press. January 18, 1992. p. B5. ↑ Funk, Marianne (February 21, 1992). McCoy's Widow Admits Helping in '72 Hijacking. Deseret News Archive Retrieved February 21, 2011. ↑ Schindler, Harold (November 24, 1996). "25 Years Later, 'D.B' Remains Tied to Utah; Skyjacker Took Story To His Grave". The Salt Lake Tribune. ↑ Some notable examples, cited by Rhodes and Calame: Cooper's age was estimated by all witnesses as mid-40s, McCoy was 29; most witnesses, including all three flight attendants, said Cooper had "dark brown, piercing" eyes, McCoy's eyes were light blue; Cooper's ears had no distinguishing characteristics, McCoy's ears stuck out so prominently that his nickname was "Dumbo", and he wore a scarf to conceal them during the Denver hijacking; Cooper drank bourbon and chain-smoked cigarettes, McCoy was an observant Mormon who did not smoke or drink alcohol; Cooper was described as having a raspy voice with no particular accent, McCoy had a noticeable southern accent, and a marked lisp due to surgical correction of a cleft palate in childhood. Rhodes & Calame (1991), pp. 86, 94, 96, 134, 145. ↑ Hamilton, Don (October 23, 2004). "F.B.I. makes new plea in D.B. Cooper case". The Seattle Times. ↑ D.B. Cooper investigation focuses on California 'off-the-books genius' Robert Rackstraw. San Jose Mercury News (July 12, 2016), retrieved September 8, 2016. ↑ Sharon, K. (October 7, 2017). California man accused of being D.B. Cooper: A life ruined or a case solved? San Jose Mercury News, retrieved November 29, 2018. ↑ Fitzgerald, M. (July 12, 2016). Fitzgerald: Was D.B. Cooper in Stockton?. Recordnet, retrieved November 29, 2018. 1 2 3 Dodd, J. (July 12, 2016). Man Identified in History Channel Show as Notorious Skyjacker D.B. Cooper Denies Accusation. People.com, retrieved December 13, 2016. ↑ "Rackstraw Says He's Not Cooper Of Skyjack Fame". Google. Eugene Register-Guard. February 7, 1979. Retrieved July 16, 2016. ↑ "In Search Of... D. B. Cooper". YouTube. In Search Of. December 6, 1979. Retrieved July 19, 2016. ↑ Baxter, Stephen (July 12, 2016). "TV investigation links Santa Cruz County native to 1971 D.B. Cooper 'skyjacking' case". Santa Cruz Sentinel. Retrieved July 12, 2016. 1 2 Lawsuit filed against FBI to make D.B. Cooper investigation file public. The Oregonian (September 8, 2016), retrieved September 22, 2016. ↑ "Investigators think letter confirms ID of D.B. Cooper". Seattle Times. January 5, 2018. Retrieved January 7, 2018. ↑ Walsh, S. (July 11, 2016). Robert Rackstraw: 5 Fast Facts You Need to Know. Heavy.com, retrieved December 13, 2016. ↑ FBI Closes Case On D.B. Cooper Skyjacking Mystery. CBS Miami (July 13, 2016), retrieved September 8, 2016. ↑ "California man accused of being D.B. Cooper: A…". MercuryNews. October 7, 2017. ↑ "The search for D.B. Cooper: Investigators say they've confirmed skyjacker's identity by decoding long-lost 'confession'". ↑ "Walter Reca Obituary - Oscoda, Michigan". www.tributes.com. Retrieved 19 July 2018. ↑ "A new 'D.B. Cooper' suspect? Yet another possible identity for the elusive hijacker". The Washington Post. Retrieved 19 July 2018. ↑ Browski, Jim (17 May 2018). "DB Cooper's identity revealed at press conference 5/17/18 [by] Walter Reca". 96 Hour News. Retrieved 19 July 2018. ↑ La Furgey, Joe (17 May 2018). "Book claims to solve D.B. Cooper mystery". WOOD TV. Retrieved 19 July 2018. ↑ "D.B. Cooper case drops another surprising suspect into the spotlight". OregonLive.com. Retrieved 19 July 2018. ↑ "D.B. Cooper author unveils evidence he says identifies infamous skyjacker". MLive.com. Retrieved 19 July 2018. ↑ Becky Vargo (26 July 2018). "GH residents help solve hijacking mystery". Grand Haven Tribune. Retrieved 29 November 2018. ↑ "Forensic investigator explains why he believes Walter Reca is D.B. Cooper". KING. Retrieved 19 July 2018. 1 2 Krajicek, David. "The D.B. Cooper Story: "I'm Dan Cooper. So Am I."". Crime Library. Archived from the original on April 6, 2008. Retrieved March 12, 2008. ↑ Himmelsbach & Worcester 1986, p. 94. ↑ Koerner, B (June 14, 2013). Paul Joseph Cini. Slate.com archive, retrieved September 4, 2015. ↑ Himmelsbach & Worcester 1986, p. 73. ↑ Killen, Andreas (January 15, 2005). The First Hijackers. New York Times Archive. Retrieved June 29, 2011. ↑ Miniclier, Kit (January 21, 2001). "Skyjacker a Colorado oddity?". Denver Post. Retrieved February 16, 2013. ↑ "Hijacker caught after parachuting over Colorado with $50,000 in cash". Lewiston Daily Sun. Associated Press. January 21, 1972. p. 1. ↑ Taylor, Daniel L. (January 21, 1972). "Parachutist hijacker captured". Eugene Register Guard. UPI. p. 3A. ↑ "Chuting hijacker caught by police". Spokesman-Review. Associated Press. January 21, 1972. p. 1. ↑ "Hijacker with $50,000 loot captured after bailing out". Milwaukee Journal. January 21, 1972. p. 1. ↑ "Hijacker foiled; tracked by jets". Spokane Daily Chronicle. Associated Press. January 21, 1972. p. 19. ↑ Skyjacker – The Richard McCoy Jr. Story (March 2, 2011). ParachutistOnLine.com Archived July 3, 2017, at the Wayback Machine Archived July 3, 2017, at the Wayback Machine Retrieved February 25, 2013. ↑ Richard Floyd McCoy, Jr. – aircraft hijacking. – FBI.gov Archived May 16, 2016, at the Wayback Machine Retrieved March 8, 2011. ↑ Whelan, Frank (June 30, 1985): "A-B-E Hijacker Who Parachuted into Jungle Is Free From Prison Air Piracy" Morning Call Archive Retrieved August 3, 2011. ↑ Lehigh Valley International Airport began as airmail stop (September 3, 2010). Lehigh Valley History Retrieved March 8, 2011. ↑ Heady, 22, Night jump, Reno, $200k, Vietnam vet, gun, sticker, caught immediately (August 1, 2008). Dropzone.com Retrieved March 8, 2011. ↑ Photo of Heady's arrest (June 3, 1972). Dropzone.com Retrieved March 8, 2011. ↑ 314-340-8132, TIM O'NEIL • toneil@post-dispatch.com >. "A Look Back • Airline hijacking at Lambert in 1972 turns bizarre". ↑ Curtis, Gene (July 8, 2007). Only in Oklahoma: Skyjacker nabs Tulsa plane in error-filled romp. TulsaWorld.com archive Retrieved March 8, 2011. 1 2 Gladwell, Malcolm. The New Yorker (October 1, 2001): Safety in the Skies. New Yorker Archive Archived December 18, 2014, at the Wayback Machine Archived December 18, 2014, at the Wayback Machine Retrieved February 14, 2011. 1 2 3 4 Wu, Annie. The History of Airport Security. SavvyTraveler.publicradio.org Retrieved February 14, 2011. ↑ Codename: Norjak The Skyjacking of Northwest Flight 305. Check-Six.com Retrieved March 4, 2013. ↑ "Codename: Norjak The Skyjacking of Northwest Flight 305 - The 1980 Copycat". Check-Six.com. Retrieved 2 September 2018. ↑ Mickolus, E.F. and Simmons, S.L. (January 12, 2011): The Terrorist List. Westport, CT: Praeger Publishers, p. 273. ISBN 0-313-37471-6. Retrieved March 4, 2013. ↑ Himmelsbach & Worcester 1986, p. 120. ↑ Gilmore, Susan (November 22, 2001). "D.B. Cooper puzzle: The legend turns 30". The Seattle Times. Retrieved January 2, 2008. ↑ Gunther 1985, p. 50. ↑ Piedmont Historical Archives Retrieved May 29, 2013. ↑ Hengi, B.I. Airlines Remembered. Midland (June 10, 2000). ISBN 1-85780-091-5, pp. 56-7. ↑ Bauman, L (May 12, 2013). Cossey Murder: Woodinville Police Chief Classifies it as Burglary. WoodinvillePatch.com archive Archived October 29, 2013, at the Wayback Machine. Retrieved October 28, 2013. ↑ Himmelsbach & Worcester 1986, p. 116. ↑ brucesmith49 (November 17, 2015). "Death in the DB Cooper "family" – Dona Elliott". themountainnewswa.net. ↑ Slatta, Richard W. (2001). The Mythical West: An Encyclopedia of Legend, Lore and Popular Culture. Colbert, Thomas J. (2016). The Last Master Outlaw: How He Outfoxed the FBI Six Times—but Not a Cold Case Team (1st ed.). Jacaranda Roots Publishing. p. 330. ISBN 978-0-9977404-3-1. Smith, Bruce A. (2016). “DB Cooper and the FBI: A Case Study of America’s Only Unsolved Hijacking.” Bruce A. Smith Publishing. ISBN 978-0-99731-200-3 (A comprehensive case study of the hijacking to include write-ups of major suspects). Wikimedia Commons has media related to D. B. Cooper. FBI Officially closes D. B. Cooper case afer 45 years. New suspect in D.B. Cooper skyjacking case unearthed by Army data analyst; FBI stays mum, The Oregonian, November 13, 2018.